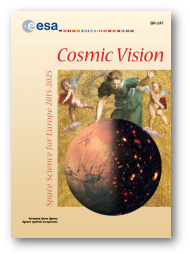 This brochure gives a detailed overview of the Cosmic Vision 2015-2025 plan. The opportunities under the above four main headings are presented, and specific aspects of each general theme that are judged to be especially ripe for investigation by new space tools in the period 2015-2025 are identified. A review of the technology that will have to be developed is given. The presented planning on behalf of the scientific community and aerospace industry takes into account the Science Directorate's preliminary reckoning of the practical constraints of technology. In the section 'Proposed Strategies and Their Implementation', the outcome of these deliberations is summarised in four tables that correspond to the above four key questions.